The global tobacco company's financials have a lot of interesting information. Investors in Philip Morris International (NYSE:PM) look back fondly on the global tobacco company's first several years as an independent company, because its stock produced amazing returns. 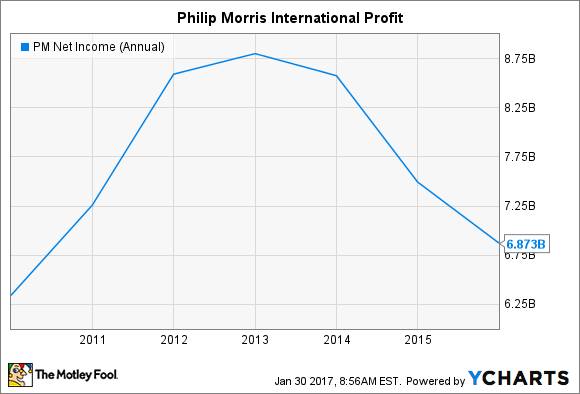 Lately, Philip Morris has had to deal with greater challenges, and some of them have held back the stock from rising in value. Indeed, looking at Philip Morris' income statement reveals some interesting trends that have affected the company's results and will continue to do so going forward. The five facts discussed below show a lot of insight into Philip Morris. 1. Revenue has fallen recently after substantial gains in past years. One reason why investors liked the idea of investing in Philip Morris International over domestic tobacco companies was that the prospects for revenue growth overseas seemed to be larger than in the U.S. market. Less regulation opened doors that were closed in the U.S., and many expected Philip Morris to take full advantage of those conditions. 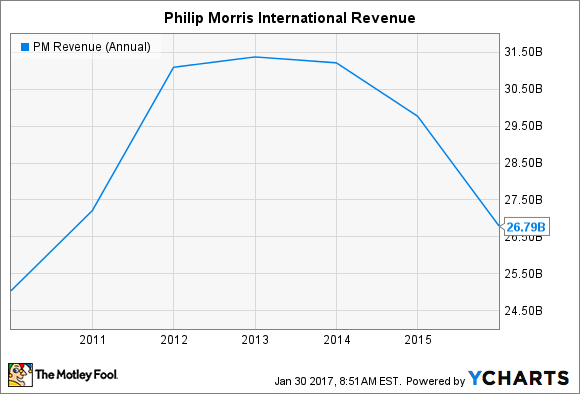 Yet Philip Morris revenue has recently fallen off from its past growth pace, as the chart below shows. PM Revenue (Annual) data by YCharts. The emergence of greater regulation in many foreign markets has taken its toll on Philip Morris. During the late 2000s and early 2010s, pricing power helped Philip Morris overcome the downward impact of heightened regulation on the business. Yet more recently, the strong U.S. dollar has had an even bigger influence on sales growth, forcing Philip Morris either to accept lower dollar-denominated sales or risk large volume drops from excessive price hikes. Neither solution has been ideal. The downward move in Philip Morris sales has been the result. 2. Profit has taken an even bigger hit. PM Net Income (Annual) data by YCharts. Again, the strength of Philip Morris' brands has allowed the company to boost prices in part to respond to currency issues. Yet the extent of the dollar's move has been large enough to pose challenges that have thus far been insurmountable. If the dollar starts to flatten out, then growth should return, but until that happens, adverse trends like the one above will continue. 3. Share counts are down substantially. Indeed, one of the things keeping the downward pressure on Philip Morris under control has been the decrease in the number of outstanding shares the company has. Since 2008, Philip Morris has cut its share count by a quarter. Unfortunately, buyback activity has evaporated in recent years, and that's been the time when the upward push on earnings per share from repurchases would have been most helpful. Nevertheless, Philip Morris has a history of looking for ways to return capital to shareholders, and once earnings bounce back, investors can fully expect the company to supplement its dividends with further share buybacks that will continue the downward trend in share count. 4. Cost controls have had mixed success. Meanwhile, on the other side of the income statement, expenses haven't been nearly as friendly to Philip Morris as one might expect. Cost of goods sold has remained relatively constant over the past seven years, with upward movement during the company's boom years largely following the revenue curve downward in 2015. But overhead expenses have jumped more than 10% since the late 2000s, showing the extent to which Philip Morris has fought to keep its market share intact. Moreover, interest expense has climbed by more than a quarter since 2009, even though an extremely favorable interest rate environment has cut financing costs for many of Philip Morris' peers. If rates rise from current levels, that could be an even bigger hit to earnings going forward. 5. Legal costs haven't yet appeared. Philip Morris investors expected foreign markets to have less legal liability, and so far, that has proven to be the case. The company hasn't reported any legal settlements since 2008, according to the latest figures from S&P Global Market Intelligence. Going forward, though, investors need to be prepared for possible legal costs. The company has sought to fight proposed regulation, and so far, it hasn't been all that successful in avoiding the application of proposed plain-packaging restrictions in several regions of the world. Philip Morris will likely never have the same risk that cigarette manufacturers in the U.S. faced, but even small defeats could be problematic. Few investors look at income statements, but they have valuable information about companies. Philip Morris' opportunities and challenges show up clearly in its financials, and it will be interesting to see how the future plays out for the tobacco giant.